Russian archeologist and Hebrew writer; born at Odessa in 1838. He received a rabbinic education; but at the age of fourteen he took up the study of medieval literature and modern languages, and soon afterward, history and archeology. Of his early essays those on fossil animals ("Ha-Meliẓ," 1866), on the life of Rabbi Solomon Bennet (ib. 1868), and on the Messianic movement and the origin of Ḥasidism ("Ha-Shaḥar," 1873-75) may be especially mentioned. Lately he has contributed to "Ha-Shiloaḥ." 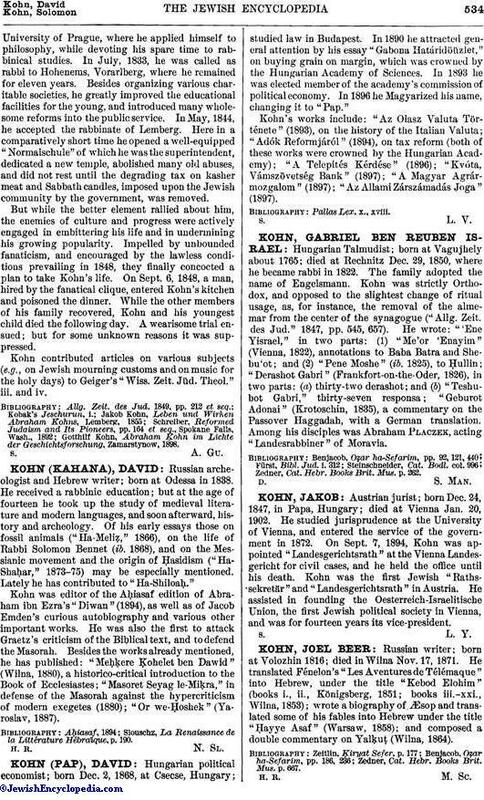 Kohn was editor of the Aḥiasaf edition of Abraham ibn Ezra's "Diwan" (1894), as well as of Jacob Emden's curious autobiography and various other important works. He was also the first to attack Graetz's criticism of the Biblical text, and to defend the Masorah. Besides the works already mentioned, he has published: "Meḥḳere Ḳohelet ben Dawid" (Wilna, 1880), a historico-critical introduction to the Book of Ecclesiastes; "Masoret Seyag le-Miḳra," in defense of the Masorah against the hypercriticism of modern exegetes (1880); "Or we-Ḥoshek" (Yaroslav, 1887). Slouschz, La Renaissance de la Littérature Hébraïque, p. 190.